What are 11 Minute Meds™? 11 Minute Meds™ are short medical grade meditations typically lasting between 3 and 11 minutes. A short meditation practice done every day has powerful effects on relief from stress, anxiety, and depression. 11 Minute Meds™ are medical grade meditations that are specifically targeted to quickly relieve stress naturally. I’ll explain how you can prove this to yourself a bit later. Many of my students say they feel the effects right away–they are fast acting. 11 Minute Meds™ are the “medications or meds” for relief from stress, anxiety, and stress-induced depression. The idea of meditation as medicine is slowly gaining acceptance in the West, and has been used for millennia in Eastern yogic traditions. Medical grade meditations are readily available to all those who seek to manage their stress, anxiety, and stress-induced depression naturally. Determine the best meditation for stress relief that works for you as you combine it with optional HRV biofeedback. Think of 11 Minute Meds™ as a daily meditation pill that helps you relieve stress, anxiety, and “Cold Depression” naturally. Cold depression is a term coined by Yogi Bhajan to describe the phenomenon that people are experiencing in modern times. Stress turns into Cold Depression when the external demands in your life are greater than your internal resources to handle them. There may be a sense of numbness and lack of joy–there’s nothing really wrong and yet where has the joy of life gone? 11 Minute Meds™ begins to relieve the cycle of stress and depression naturally by balancing and strengthening yo. With a personal commitment to 11 minutes a day your relationship to stress will change. I will share in a moment how to do this and to measure your progress. Practicing 11 Minute Meds™ on a daily basis was a game changer for me. I now have a powerful tool at my disposal to not only recover from stress and depression, but to build up resiliency so that I am less prone to stress and depression. 11 Minute Meds™ come from the Kundalini Yoga tradition, as taught by Yogi Bhajan. The power of meditation is a potent antidote to stress, anxiety, and stress-related depression. Scientific literature is now filled with the measurable benefits of a daily meditation practice. 11 Minute Meds™ gently adjusts your nervous and hormonal systems through this ancient scientific technology. As I trained scientist, I continue to be amazed how much the yogis knew about how to self-regulate the body and mind (soma and psyche) to heal the nervous and hormonal systems. Just as one example, the yogis call the tenth cranial nerve (vagus nerve) that controls most of our autonomic processes such as breathing, heart rate, digestion, sexual response (and more) as the “Central Tuning String of the Body.” In other words, if the vagus nerve is “in tune” than the mind-body would regulate itself back into line. Rather than learn scientific terms (although we will do that in blog posts) just think of 11 Minute Meds™ as a way to tune the main tuning string of your body which in turn aligns the other strings or nerves. When you practice 11 Minute Meds™ you are adjusting your nervous and hormonal systems. And that’s just the beginning! Subtle energy channels are adjusted as well as your bio-electromagnetic field. Meditations become natural medications. Meditation teaches you how to self-regulate the flow of thoughts and emotional states with the use of breath, eye focus, hand positions (mudras), and chanting (mantras). 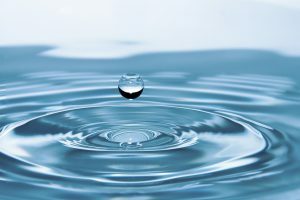 “Thought drops” cause ripples in your state of mind. Meditation helps keep them from growing into giant waves. The continual stream of positive and negative thoughts, much like throwing stones into a calm lake, causes ripples in the and obscures the calmness of the neutral mind, whose home is the heart center. With consistent practice the mind comes under your control, the neutral mind prevails and you learn how to respond to stress in new ways–naturally. 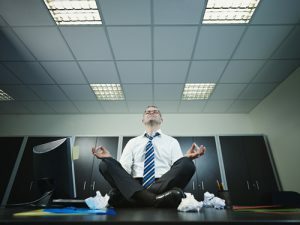 Many of the 11 Minute Meds™ are “busy” meditations, meaning you are typically keeping track of several different things at a time such as breath pattern, eye focus, hand positions, and sometimes chanting. One of the benefits of juggling these meditative techniques is that it gives the ego a job to do, a very important one at that. As you go forward practicing 11 Minute Meds™ for relieving stress naturally you will understand what I mean. Some things are simply experienced firsthand. 11 Minute Meds™ are usually practiced sitting cross legged on the floor making sure that you have a straight spine. If you cannot sit on the floor comfortably, try sitting on a chair with your back supporting itself and feet flat on the floor. Step 1: Choose a Meditation that resonates with you. Several 11 Minute Meds™ are provided under the 11 Minute Meds™ drop down menu. Some will have YouTube videos for you to follow along with. Step 2: Set an Intention to Relieve Stress Naturally or whatever you would like to heal or transform. Setting an intention has an almost immediate effect on your body-mind. I bow to the infinite teacher within, and open myself to the infinite source of wisdom, healing, and creativity within me. Before starting any of the meditations, take a few moments to “tune-in.” Place your hands at the heart center, and feel the knuckles of the thumbs press into the notch in the breastbone. This is a reflex point for the vagus nerve–allow the vibration of the mantra to penetrate from your hands into your heart. This mantra is used for “tuning in” to your heart’s wisdom and self-knowledge that exists within each of us. It opens the body and psyche up for healing. Tuning-in is a call to your higher Self, the healer within, and aligns you with Infinite source. Set your intention for healing and connect with your inner Heart’s Wisdom. Step 4: Follow the directions on the meditation or follow along on the video, if available. Don’t be discouraged if it feels ridiculous or if your ego starts butting in on why this is the dumbest idea you’ve ever seen. And it will kick up at some point. Simply notice and come back to the breath–you’re on your way. End: Sit for a few moments after the meditation and notice how you are feeling. Journal your progress and watch the changes in your relationship with stress, anxiety, and depression shift in time. Who are 11-Minute Meds™ for? 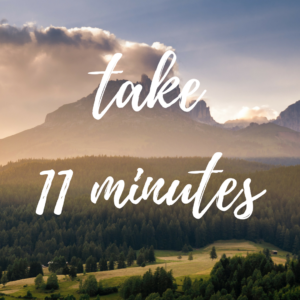 11-Minute Meds™ can be done just about anyone–if you can breath and follow simple directions, you can practice 11-Minute Meds™. There are varying degrees of difficulty so if you’re not familiar with meditating, begin with one that you find easy to do and build from there. Many of the 11-Minute Meds™ require breath regulation, which may be challenging for some people. Start slowly with 3 minutes and build up to 11 minutes or longer if desired. Do not the simplicity of some of these meditations fool you! I encourage interested people to combine your 11-Minute Meds™ practice with HRV biofeedback to see first hand how breathing patterns and meditations affect your nervous system. Always use common sense and if you become dizzy stop and breath normally. Most people that I have taught do not experience much difficulty. Check with your health care practitioner as needed, and remember this is NOT a substitute for your current health care protocol. It is best to practice the same time every day, and preferably when you first get up in the morning. If that doesn’t work for you see if you can choose another time that is consistent. If you find 11 minutes too challenging begin with 3 minutes and build up to 11 minutes. Some meditations have shorter or longer durations–adjust as needed. Yogis often practice yoga and meditation during the “Ambrosial Hours,” 2 1/2 hours before sunrise. If your an early riser try this, but if your like me that is simply too early. I do try to practice my 11-Minute Meds™ before the sun rises and if I miss it I try not to let that be an excuse to skip it all together. Anytime is better than no time. It takes 40 days to change a habit. To achieve health benefits of meditations first learn the meditation and then practice it every day for at least 40 days. How do I Know if 11-Minute Meds™ are Working For Me? 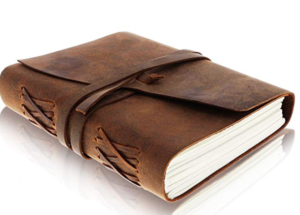 One easy and inexpensive way to measure your progress is to record your experience in your journal daily. What may seem like minuscule changes or events day by day are cumulative. Often your friends and family will notice your emotional state of more calmness quicker than you will. Remember, do a selected meditation for a minimum of 40 days to receive the health benefits. Journal your reflections, inspirations, fears, and triumphs. Every day on the meditation mat is a different experience. As you begin your meditation practice you may find resistances come up–just allow them to be, but record your reactions. Your ego will likely kick up a fuss as you try to remain centered and focused on your breath. It’s a normal part of the process, one that everyone goes through. If the meditations make you agitated–write it down. If you start bawling your eyes out–write it down. Or maybe, on some days, you’ll feel a gentle bliss surrounding you–write it down. Are you the type of person who wants to see the evidence that something is working? I know that I am. I’ve been amazed seeing first hand how these powerful meditations effect my nervous system almost immediately. This step is purely optional, but well worth the effort and small investment. 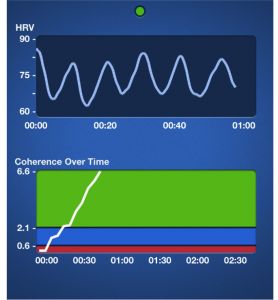 Once you’ve mastered a meditation add a few minutes of HRV biofeedback to document your progress. 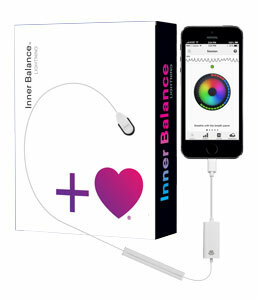 I use the Inner Balance iPhone app by HeartMath® HRV biofeedback, but don’t allow yourself to become distracted. Try HeartMath® HRV biofeedback before or after the meditation if you are not able to into a mindful state while practicing. I have found that long time meditators have an easy time getting into the “zone of coherence” whereas new practitioners may become easily distracted and more concerned with getting into high heart coherence. First: learn the meditation and practice it for 40 days or longer. Then begin to measure your progress using HRV Biofeedback. Use a dedicated mat for your meditation practice. A folded up blanket will do nicely or invest in a mat and supporting props that you can place under your knees or sit on. 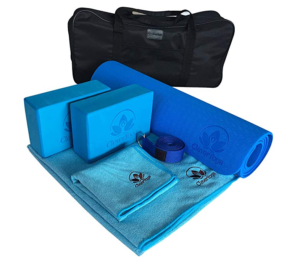 This mat set will transition nicely into a yoga practice if you choose to practice yoga as well, which I highly recommend! 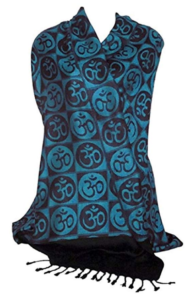 Stay warm and comfortable while you’re meditating. It’s a really nice touch to have a dedicated shawl that is reserved for meditation practice. Although not essential, I have found that having dedicated items for meditation helps me to ground quickly and go deeply into meditation. The information provided in this website does not intend to suggest or imply an either or approach to healing; rather, a partnership with your health provider where you augment your own care by gaining Self-Mastery over areas that you can control. The ancient traditions knew a thing or two about how to regulate the nervous system and stress, and how to perform yoga breathing for anxiety. Some of the links in this page and on https://HowToRelieveStressNaturally.com are affiliate links. This means if you click on the link and purchase the item, I will receive an affiliate commission at no extra cost to you. All opinions remain my own.